1. Every day when you come home, your family is like being demolished. 3. When it was manicured, it did not cooperate and accidentally cut the bleeding. But don't worry, this pet nail grinder can give your love pet a gentle and painless beauty and trim experience. 1. Safe and Effective - Change the traditional way of pet manicure, using grinding head grinding method, convenient and safe to use, do not fear baby cut bleeding, and easily and effectively trim pet's nails. 2. Low noise and Low Vibration - The nail clippers are equipped with a specially designed ultra-quiet motor with low vibration and gentle, fast pressure-free, blood-free manicure. Pet lovers are no longer scared. 3. 3 Openings in The Grinder Area - Which opening to use depends on the size of your pet and its nail characteristics. Manicure and shaping, as well as smoothing the rough nails of dogs, cats, rabbits and birds. 1. The first time you use an electric nail polisher, it is recommended to sharpen sharp nails first, but not so much as to avoid bleeding. 2. For your pet's safety, the continuous grinding time of one part should not exceed 5 seconds, and pay attention to adjust the angle to polish pet nails. 3. Please do not use water, alcohol and other liquids to clean the grinding head. We offer 90 days free replacement and 1 year free warranty,If this pet nail grinder is not suitable for your pets to use, broken or doesn't work, please do not hesitate contact with us and we will refund or provide replacement for you. ★SAFE & EFFECTIVE - Our grinder is manufactured with diamond bit grinder, which is safer and more effective than nail clipper to trim pet nails, reducing the risk of clipping the claws too short or hurt your pet. 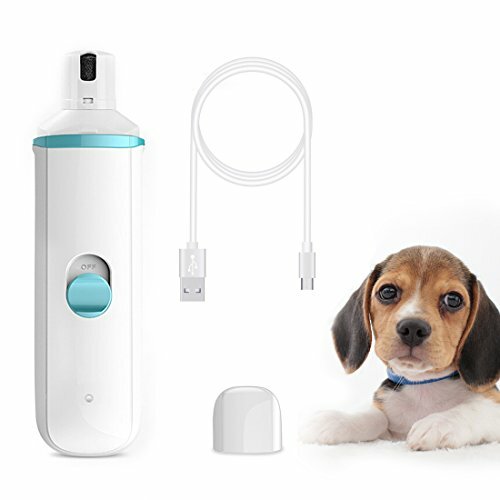 ★LOW NOISE - Mute and low noise, making your pet trim their nails without fear. It doesn't mean that this item has no noise. The slight noise may be not suitable for very young pets or puppies. ★THREE SIZE PORTS - There are three openings in the grinder area,you can use depending on your pet's nail size.The small and medium openings are for small and medium sized pets,For larger pets,the entire cover can be removed to expose the entire bit to easily trim large nails. ★USB CHARGING - The dog nail grinder is rechargeable by USB. 2 hours full charge can be used for 4 hours continuously.Perfect for pet grooming store or home using. ★BUY WITH CONFIDENCE- 90 days free replacement and 1 year free warranty,If this pet nail grinder is not suitable for your pets to use, broken or doesn't work, please do not hesitate contact with us and we will refund or provide replacement for you.